I've been trying various potato recipes that pop into my head lately and have found a new family favorite. This one is on the menu for dinner tonight, alongside my five bean chili. 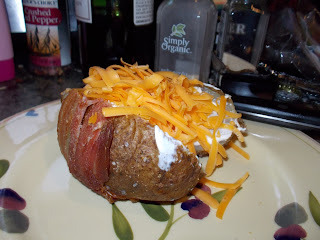 Now I should begin by saying that I've never been a huge baked potato fan. But this recipe has me craving potatoes (and bacon). And that's why I wanted to share it with you! Preheat your the oven to 350 degrees. Now's also the time to put a cookie sheet on the counter so that you don't have to go looking for one when your hands are covered with olive oil! Prepare the potatoes by washing and drying and piercing with a fork. Using your hands coat each potato with olive oil and then rub each potato with the garlic powder mixture. 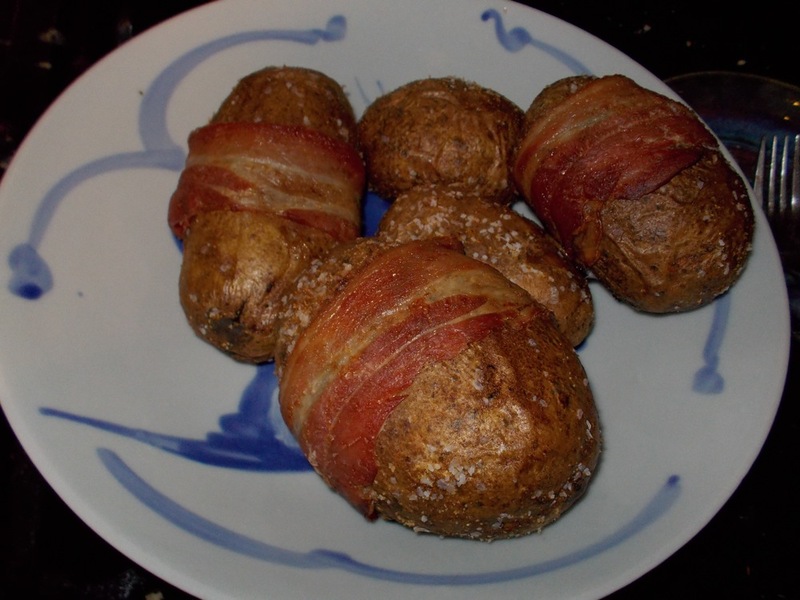 Wrap each potato with a piece of bacon (or more) and place them on the cookie sheet. I used Applegate Naturals Uncured Sunday Bacon which is nitrate free. Bake at 350 degrees for 45 minutes or until the potato is done. Slice each potato open and add your favorite toppings (I listed mine above). I'm excited to try this with additional pieces of bacon so the entire potato is wrapped up in a layer of bacon! Last time I just used one to see how it would cook, but now that I've tried it I definitely want to try on that's wrapped in several pieces. I can tell that you have had the oil hand.. Where the hell is the cookie sheet? Problem. It looks very taste when I get a new oven I'll have to try this one out. Oh, yum! I also love bacon but avoid nitrites/nitrates. Applewood is excellent, and I've started to see a few more brands in our local grocery stores. Will try this for sure. BTW - thank you so much for the recommendation to check out the Moxie Wife site a week or two back. My daughter went to hear Hallie speak (at the church where Hallie was married, and which was our first parish here 35+ years ago) and found her delightful. This has led to my daughter finding a wonderful group of young Catholic moms, and to joining their prayer group. She has yearned to find other young Catholic women who share her outlook, and now she has! This looks indulgent but yikes on the fat and calories!